Picayune is a precious coin in the purse of the south. Rich in history, nature, culture and more! Picayune is a rare name for a unique place. Search the world and the only city named Picayune is found in South Mississippi. The appeal of the area is obvious to anyone who visits the area. However, how Picayune got its name traces back to a Spanish coin and a well-renowned newspaper still published today. When the railroad came through in the 1880’s the then known community of Hobolochitto turned to one of its prestigious residents Eliza Jane Poitevent Nicholson, better known by her pen name “Pearl Rivers,” to name the area. Mrs. Nicholson was the owner and publisher of the New Orleans Daily Picayune named after a Spanish coin called a “picayune”. She chose to name the city after her beloved newspaper. Today the paper is still published but is now called the Times-Picayune. In 1904, Picayune was incorporated as a township under the name given by Poitevent. 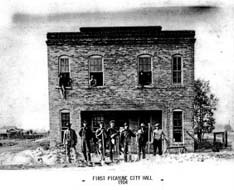 Seventeen years later Picayune was incorporated as a city. The centerpiece of the central business district today is Picayune’s City Hall built in 1939 by the architect Mr. Wilfred Lockyer, who also designed the interior of the chapel in the famous Titanic cruise ship. Today, many of the beginning Picayune landmarks are still around symbolizing the cities resolve to thrive for years to come. The Pearl River County Historical Society is a non-profit organization which endeavors to preserve, record and disseminate information about our county in Mississippi.